If ever there is a contest for the most inappropriate appearance on a TV show, Mark and Richard should win it. They were not particularly ‘Ready’, certainly not ‘Steady’ and neither of them had got beyond a tin-opener and a microwave. So how did it all happen? Pete, one of our founder members and with many successful Pork Pie Club TV and radio appearances in his ‘PR Portfolio’, also declined the invitation, as did every other club member before Mark and Richard got the call. The audition was at BBC Manchester in August 2005. We (Mark and Richard) wore our Pork Pie tee-shirts (sponsored by the British Meat Association) and Mark had brought some (whose *****?) pies to take to the audition. They came in very handy when we arrived, as we were easily able to bribe a hungry security guard to let us park in the BBC car park. There were about six couples waiting to be auditioned. From their conversation, it was clearly a lifetime ambition to appear on the show. “Isn’t Ainsley gorgeous?” said a mature lady from Prestatyn, who had been on a lengthy waiting list and was visibly miffed that Mark and I had no particular interest in cooking and had been invited to audition. The audition seemed to go quite well. We were filmed answering questions on pork pies and the Pork Pie Club. Giving fresh pies to Jason and Sian (the researchers) also helped! We were anticipating quite a long wait for the results of the auditions, but the call to appear on the show came fairly quickly. We assumed that the ladies from Prestatyn had been unsuccessful. We were sent questionnaires, which asked us a number of questions, including what ingredients we would like to include in our bag, and what we would include if it was a ‘gourmet’ bag. We were told the date for the filming, which was to be in the BBC Wandsworth studios, and Amy (from the BBC) sorted out all the travel arrangements etc. 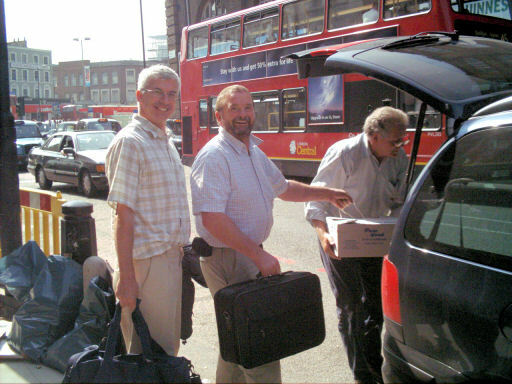 At this stage we were still in excited mode, then the day arrived ……..
Mark had arranged to meet Richard Grange (son of Eddie Grange, Slaithwaite butcher and master pie maker) to collect 20 ultra-fresh pies before we got the train to London. 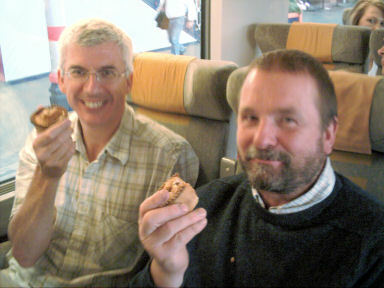 We arrived at Wakefield Westgate with an hour to spare, and the aroma of fresh pies was so tantalizing that we ate a couple on the train. We were met at London Kings Cross by a taxi driver who did regular ‘TV runs’. On arrival at the studios, we thanked him with a pie. We signed in at reception, where Phil Vickery rushed past as he was about to appear on a recording. We were then taken to a room which would be our ‘base’ for being briefed, waiting for the show etc. The room was well equipped, with TV screen, fruit, drinks etc. Next door was a make-up and dressing room. We had been asked to take three different outfits for the costume lady to choose from. Richard was beginning to wish he had bought a new shirt! The outfits chosen, they were promptly ironed and returned by the costume lady. Jason came in to brief us about the show and to run some example questions by us. He was clearly becoming increasingly anxious about selecting us, as he struggled to weigh up Mark’s dry and tongue-in-cheek responses. We were invited to watch the live recording of the Ready Steady Cook show which preceded ours (they record three in a day) – it was a celebrity show featuring stars from ‘The Bill’, but we preferred to watch the Ashes Oval test! Mark, who was beginning to realize what we had let ourselves in for, said he was ‘bricking it’. Richard was not as nervous, but was worried about the cooking aspect, particularly as his Chef was new to the programme. We went on to the set and were given a quick rundown on the kitchen areas – where the fridge was, the utensils, ingredients etc. 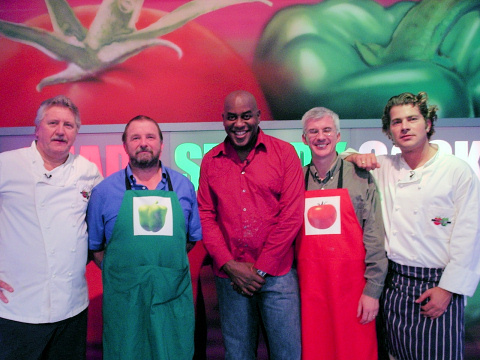 We were introduced to our Chefs – Brian Turner, who was paired with Mark, Ed Baines, who was paired with Richard; and Ainsley, the programme compare. They were all very friendly and reassuring. Judging by the perspiration index, Mark did not look too reassured! We took our places in the studio audience and the programme started. Mark (green pepper) was first to run down the steps on to the set and talk about the contents of his bag. Richard (red tomato) was next. The next 20 minutes was the main event – Richard went into a mild panic because Ed Baines asked him to make some puff pastry twirls, and Mark was in full flight – exchanging Yorkshire banter with his mate Brian. Soon it was over and the chefs had done a great job despite the incompetence of their pie club guests. Now came the vote, and red tomatoes won hands down (we suspect because Ed Baines is much better looking than Brian Turner). After the show we were able to take photos with the celebrities, who all signed copies of their books which we had taken with a view to auctioning for the pie club charity appeals. Mark and Richard were then given the finished dishes to eat at a table, but we were so ‘wound up’ that neither was very hungry. Also it must have been one of the humid days of the year and we were lathered. 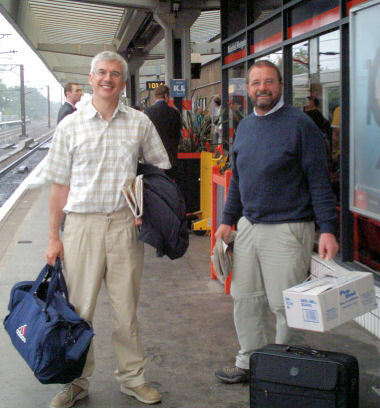 Mark distributed the remaining pies to the celebs and the backroom staff and we made our way back to Kings Cross by taxi, only to run 300 meters for the wrong train at the far end of the platform. Mark looked as though he was about to collapse! We had a beer in the station bar and waited for our train, which was delayed due to lightning strikes (of the thunder variety, not industrial relations problems). On the train we were able to impress the train staff with our new-found fame, which helped pass the time. We arrived back at Wakefield, still very hot, and much more weary than when we had left, but still on a high. It had been a fantastic day.